One of the most effective ways to advertise a business is frequently overlooked by companies when preparing their advertising plans. While this form of advertising is not good for all businesses Vehicle Wrapping will impact the bottom line of businesses from most industries. Vehicle Wrapping is a mobile sign, a cost effective visual on the road and anywhere it is parked. Why vehicle wrapping? Unlike print or web advertisements, which have recurring payments, vehicle wraps are a one-time fixed cost that last the lifetime of the vehicle or of the wrap itself. Using a wrap for a business vehicle is an ingenious way to market a business. It’s the easiest way to announce a brand to the local market, and allows for instant brand recognition. Imagine that you’re driving home from work one day. You’re stopped at a red light for 20 seconds, next to a big truck featuring the large logo of a carpet company. The truck drives off and you see the carpet company’s website displayed on the back of the vehicle. Whether or not you need a carpet, you’ll certainly remember that large logo. No matter where that truck goes, its vehicle wrap is providing advertising. It’s alerts everyone who looks at it about your company. The impressions that a vehicle wrap will have is exponentially more than what highly optimized SEO currently offers in web searches. Think about how many people will see it on a daily basis. 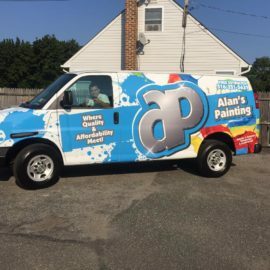 If a vehicle with a wrap is parked outside a business, hundreds of cars will drive by each day and take notice of the company’s logo. Other people will see it on the road. Every time the vehicle is parked somewhere, it is advertising to anyone who walks by. Vehicle wraps are also a cost-effective advertising solution with vehicle graphics starting as low as $500. When you calculate the cost of the wrap and estimate how many people see it every day, the cost is literally pennies per day. Many people are concerned about how a vehicle wrap might affect their car. However, a wrap will not damage a vehicle’s paint job. They are quickly installed and uninstalled leaving the condition of the vehicle intact. A good vehicle wrap can last for years, depending on climate conditions and how well it is cared for. If a vehicle is left out in the sun all day, it will fade more quickly than if it’s stored in a garage. 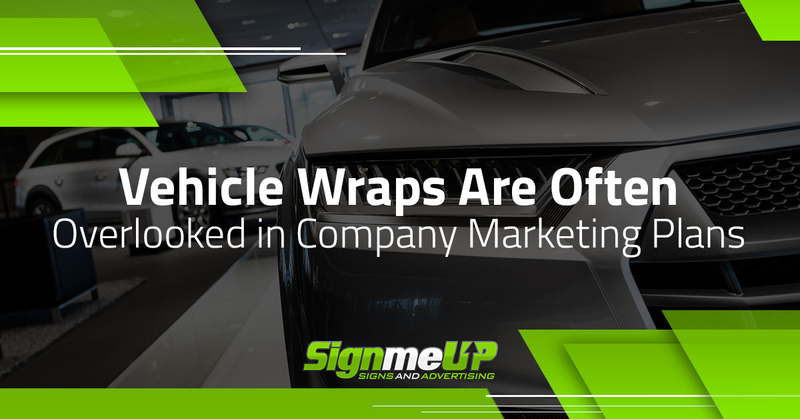 The vehicle wrap manufacturer will provide a warranty for 1-2 years, but on average, a wrap will last from 4-6 years without any rips, tears, or fading. If the vehicle is in an accident that damages the wrap, it doesn’t necessarily need to be replaced. It is possible to simply replace the damaged areas of the wrap. So how do you know if a vehicle wrap is right for your company? While we would like to say that every company should get one, it’s not for everyone. For a company whose branding is simple and straightforward, a loud, impactful vehicle wrap may not be a suitable option. Not everyone is comfortable driving around in a vehicle with a large design on it. For most companies, though, a vehicle wrap is a beneficial and easy way of advertising. For some industries, vehicle wrapping is a virtual necessity. Nearly every home improvement company such as roofing, plumbing, painting, or tiling can benefit from a vehicle wrap. Any business which relies on making home visits should get a wrap on their company vehicle. Many industries are realizing the benefits of expanding their business with eye-catching wraps. We create many customized vehicle wraps at Sign Me Up Signs and Advertising. As with all of our products, each wrap we create is designed using our collaborative design process. We make sure to do careful industry research so that the design is suited to the industry. We establish the best placement for relevant information on the wrap such as website, logo, slogan, or even a QR code. To learn more about vehicle wraps or to see examples of some of the work we have done with other companies, visit our website. 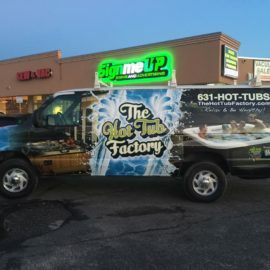 If you’re ready to advertise your business with a wrap, give us a call at (631)226-3838 or email us at sales@signmeupadvertising.com. We look forward to using our expertise to help you grow and market your business.